The OSS® ASN.1 Tools for C# is a powerful development tool for rapidly building applications using ASN.1. This product features a powerful ASN.1:2015 capable compiler, a runtime DLL with ASN.1 BER, DER, PER/UPER, CPER/CUPER, XER, CXER, E-XER, OER, COER, and JSON encoder/decoder engines, and a rich collection of utilities to simplify and speed your development. Our ASN.1 products support LTE Advanced Pro including NB-IoT, C-V2X and LTE-M. OSS products will support the 3GPP 5G specifications which will be released in 2018. You can now use OSS' new ASN.1 IDE which is packed with features that you need to describe your data in ASN.1, syntax-check your ASN.1 schema, generate C# wrappers, debug ASN.1 messages, and more. 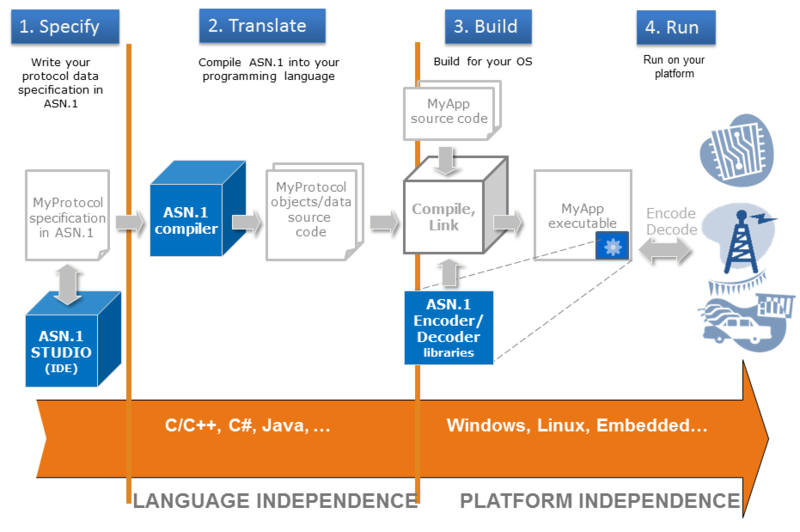 The compiler takes ASN.1 specifications as input, and generates C# language classes. In addition to core functionalities, the OSS ASN.1/C# compiler offers extensive diagnostic capabilities to minimize your development time and effort. A runtime DLL provides ASN.1 encoding and decoding functions and auxiliary functions to operate on application messages. For a list of the ASN.1 standards that the OSS ASN. Tools for C# conforms to, see the Standards Conformance page. More information about how to create, compile and link your ASN.1 application using the ASN.1/C# Tools. Download the ASN.1/C# Tools today!